Union Rescue Mission (URM) is one of the largest missions of its kind in America — bringing help and hope to men, women, and children experiencing homelessness in Downtown Los Angeles. URM was founded in 1891 by Lyman Stewart, president and founder of Union Oil Company. George A. Hilton served as the first superintendent of the Mission, originally known as the Pacific Gospel Union. During those early days, URM took to the streets in gospel wagons to offer food, clothing, and salvation to the less fortunate. Over the years, URM has continued and expanded its efforts to feed both the body and the soul, helping individuals and families break the cycle of poverty and achieve self-sufficiency. URM serves over 500 people a day from temporary sites where tents were rigged for nightly revivals. URM purchases its first permanent home at 145 North Main Street – a haven of hope where the poor find three meals a day, clothing, and shelter, as well as employment assistance and free medical aid. 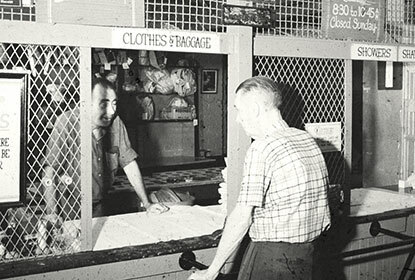 During the Depression, the Mission supplies 42 percent of all free meals provided by private charities in Los Angeles. URM establishes the Victory Service Club – a spiritual haven and gathering place for nearly two million servicemen during the war years. Responding to the tragic appearance of women and children among the homeless, URM establishes the Bethel Haven Women and Family Shelter. Demonstrating vision and commitment, URM opens its $29 million, 225,000-square-foot facility at 545 South San Pedro Street specifically designed to meet the needs of today’s homeless population, especially women and children. The building can shelter a thousand people per night and includes a computer-based learning center, library, children’s play and study areas, gymnasium. The Bank of America Learning Center opens on the 4th floor, offering basic literacy instruction, high school diplomas, and computer training. In response to the growing number of women and children experiencing homelessness, the Family Shelter opens on URM’s 4th floor, providing 84 more emergency beds, bringing the total number of beds for women and children to 194. February 25th: Opening of The Thomas D. Grimes Men’s Transitional Residence on the 5th floor. August 8th will always be a special day in the history of Union Rescue Mission. This is the day senior women began moving from the Mission to Hope Gardens Family Center to live in the Senior Permanent Supportive Housing Complex, Sequoia Lodge. December 4th is the Mission’s 115th Anniversary serving men, women, and children experiencing homelessness in Los Angeles. January 31st The first Internet Café in Skid Row opened on our first floor, providing a welcoming atmosphere to the community and affordable internet and café services. May. The women’s exercise room on the fourth floor is completed and opened, complete with treadmills, exercise balls, a rowing machine, and more. June. Hope Gardens Family Center was approved to house additional women and children. The first phase of families moved in on June 27, 2007. 4 families (4 moms, 8 children); 3 families from Union Rescue Mission’s 1st Step program. Winter Shelters: When no other agency would respond to the County and City’s call to open up winter shelters at three different sites, URM responded, and through our public benefits charity EIMAGO, teamed with the LA Homeless Services Authority to open up winter shelter sites at the armories in Burbank, West LA, Culver City and added over 100 beds to the downtown facility for a total of 570 extra beds, increasing the Mission’s capacity for the three cold and rainy months by nearly 50% (Dec. to March). URM leadership saw the economic downturn and its impact on families, the decision was made to not only stay on course welcoming those struggling in poverty with the love of Christ, but in order to live up to our history during the Great Depression, we stepped it up a notch to meet the growing need. We converted our 5th floor, previously saved for VIP’s and volunteer groups, into housing for two-parent families and single Dads with children. Two groups we had not often seen coming to the Mission previously. It didn’t take long to be at full capacity on the 5th floor with overflow tents (EDAR’s) placed in the Mission’s Chapel and 5th floor meeting rooms to accommodate families who have never before experienced homelessness. On April 1, the Mission’s Leadership embraced CEO, Andy Bales desire to instill a greater sense of responsibility and dignity in guests using free long-term shelter beds. The Gateway Program was established offering a bed for 15 days free of charge. Guests were then given the opportunity to pay a small fee for a bed or enter the men’s CLDP/Recovery program or receive referrals to other facilities. In November Union Rescue Mission opens a Thrift Store at 280 E. Arrow Highway, Covina. Union Rescue Mission celebrates 125 years of continuous service to people experiencing homelessness in Los Angeles.